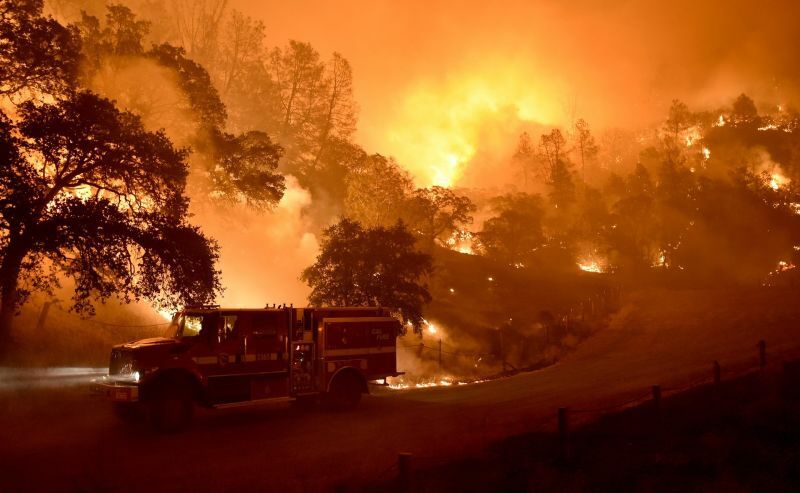 As bad as things are already, the system in place to manage California's wildfire season is already "stretched very, very thinly," according to Mark Ghilarducci, who directs the state's Office of Emergency Services. “The fire season itself has probably been the most extreme that I’ve seen in my 30 years," said Ghilarducci in a state-produced video interview on Tuesday. The "rainy season" is still a good six weeks away though don't tell L.A. residents who got a surprise drenching of nearly two inches of rain in one morning this week. The Southland has seen other freak rains this summer, which washed out a freeway overpass and forced the first Major League Baseball rain-outs in two decades. Those were shards from an active Pacific hurricane season, probably linked to El Niño. But the light rain that fell near the Valley Fire on Monday, never even made it to the ground, according to officials on the scene. In fact, preliminary research at San Jose State University's Fire Weather Research Lab suggests that the virga actually made matters worse on the ground. "The rain that we saw in Southern California notwithstanding, it certainly hasn’t rained like that up north and even in the south it will dry out quickly," warns Stanford climate scientist Daniel Swain. "California is still experiencing really severe drought conditions and we definitely have a few more months before we see substantial relief." Swain says that even if the current El Niño conditions in the Pacific turn out to be a major rainmaker, California is not likely to see the peak effects until December or January. Meanwhile, each passing week without substantial precipitation increases evaporation, baking out what little moisture remains in soils and setting the stage for more severe wildfires. Some of California's most aggressive fires are driven by what scientists call katabatic winds, better known as Santa Anas in Southern California, Diablos in the north. In the fall, the usual onshore breezes start backing around and dry easterly winds roar through mountain passes, speeding up and heating up along the way. This season, some fires have behaved like classic Santa Ana-driven fires -- without the winds. The devastating Valley Fire north of the Bay Area stunned firefighters, blowing up to 40,000 acres in one day. "The fire would throw embers a half-mile beyond where firefighters were working, said Cal Fire spokesman Daniel Berlant. "This is the kind of fire we would see with Santa Ana winds but in our area, this is unprecedented." Add to the mix the abnormally high temperatures that have persisted this summer, often at the most inopportune times, such as the early days of the Valley Fire. "This late-season heat really sort of sets the stage for any big offshore wind events—these Santa Ana or Diablo winds that often occur later in the fall," warns Swain. 2014 went down as California's warmest year on record and 2015 is on track to beat it. According to NOAA, the statewide average temperature was slightly above normal in July, then spiked to nearly 3 degrees Fahrenheit above the 20th Century average in August. Some of the state's most catastrophic fires have broken out in October, including the historic Oakland Hills firestorm, which destroyed more than 3,000 homes in 1991. "All the vegetation is drought-stressed and especially dry given the heat wave, and so if and when we get these big wind events over the next couple of months, that’s probably going to lead to some big problems," says Swain.